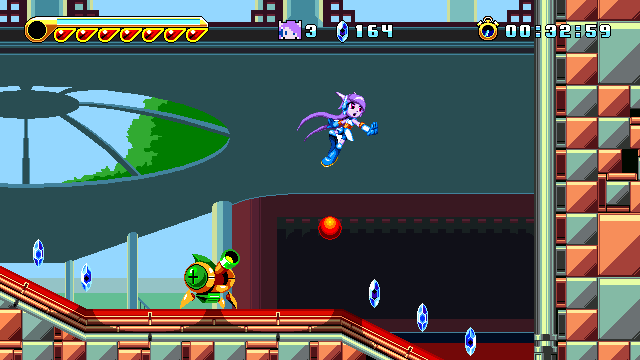 So, there's practically no information about this game, but the first Freedom Planet was so good that we're posting the teaser anyway. In the first game, players took control of one of three anthropomorphic animals, each with their own unique abilities and playstyles in a colorful world styled after 16-bit classics like Ristar, Rocket Knight Adventures, and especially Sonic the Hedgehog. The trio of characters and their trademark abilities return in the sequel with Lylac's hair whip and high-speed dash, Carol's wall-riding motorcycle, and Milla's strange energy powers, as well as some new abilities. A new evil has arisen in the form of Merga, an ancient water dragon that has been released due to the events at the end of the first game, and this time, the heroes find their allegiances split between opposing sides. The characters are a bit older now, more mature and experienced, and several new characters are being introduced, many voiced by actors from a number of well-known animated series. The game has a long way to go... Galaxy Trail plans to have the beta ready 2017, but there is no formal release date yet. The game will be released for PC, Mac, and Linux, followed by Nintendo's platform, with other console versions TBD. We'll be watching this one and keeping the Master List updated with any changes. Below are the initial teaser (sorry, no gameplay) and a screenshot mockup.